Recently DK8OK wrote in to us and wanted to share his latest review of the Airspy and SpyVerter combo (pdf). 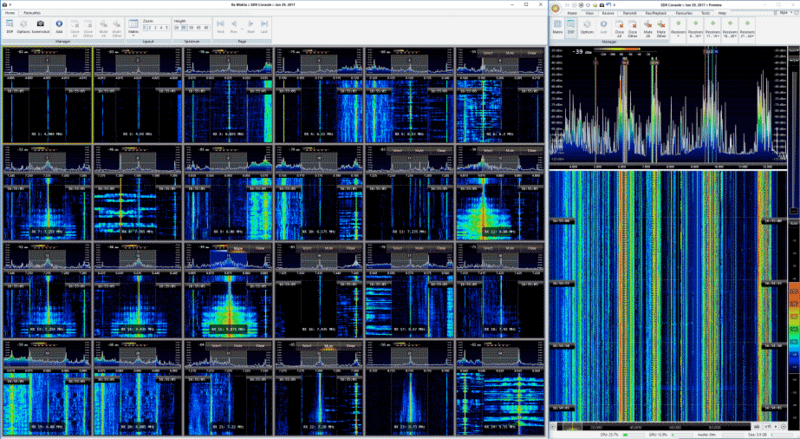 His review focuses on HF usage and he shows various examples of HF signals that he has received with the Airspy+SV such as the CHU time station, STANAG, DRM, ALE, HFFAX, VOLMET and HFDL. He also shows some tricks for optimizing HF reception, a tutorial on performing multi-channel audio recording and decoding in SDR-Console, a tutorial on playing and analyzing recorded files as well as some examples of weak signal reception. Overall DK8OK praises the Airspy+SV combo citing it’s excellent dynamic range as one of the reasons it performs so well. We should note that for prospective buyers, the Airspy team is currently working on a new complimentary solution for HF monitoring called the Airspy HF+. This will have extremely high dynamic range (even higher than the Airspy+SV combo), but it will have a smaller bandwidth. So the Airspy+SV combo will still be the best for monitoring a wide 9 MHz chunk of the HF band, whilst the HF+ will be the best for getting into those very hard to receive signals. Update: The paper is now also available in French. Interesting… The PDF shows the Spyverter R2. Now I understand why iTead offers a 17% rebate on the Spyverter. Yeah, but not read this version on sdr# website. https://twitter.com/lambdaprog/status/842684418951188480 “New orders will get the new SpyVerter R2 automatically.” <- dated the 17th of March, that would suggest it is because they are only shipping the R2.